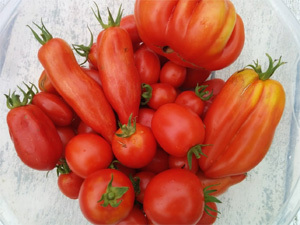 We grow a mix of heirloom variety paste tomatoes that are used for producing our pasta sauces and BBQ sauces. Varieties such as Opalka, Amish paste, Red Pear Periform, Polish Linguisa, and the famous San Marzano have long been bred primarily for their flavour as sauce tomatoes over commercial production needs of yields and pest resistance. This jar of diced tomatoes lets you sample the full summer flavour of these exquisite tomatoes picked at peak ripeness. By blending these varieties we seek to balance out the flavours, acidity and sweetnessn in the search for something closer to perfection. The field blend creates a unique mix for each batch depending on how many of each variety were ripe on that day of picking. Enjoy these tomatoes in your own sauces, soups, stews or any recipe that uses canned tomatoes. We grow the ingredients for our sauces using no-till, no-spray, no chemical fertilizer farming methods to facilitate an environment where soil micro-organisms flourish. This below surface ecosystem nourishes the plants naturally allowing them to express their fullest genetic potential with maximum nutrient density to reveal their very best flavours. As we develop and improve our farming systems it's our tomatoes that are at the forefront of our experiments on building biomass/organic matter and storing carbon in the soil. Techniques that show promise and can scale well later get incorporated into our pepper beds. 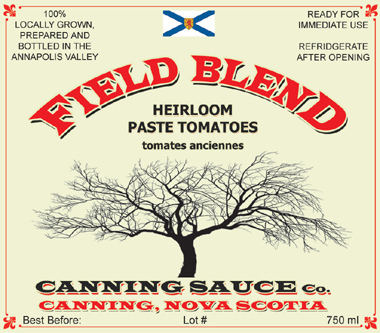 Well, the flavours of our tomatoes are simply amazing. So incredibly fresh and vibrant. For this reason we decided to offer them as a stand alone product besides their appearance in our pasta and BBQ sauces. To retain these amazing flavours we take careful steps during processing and bottling. We use just enough vinegar to nudge the acidity into long term safe storage range. For that we use local pear vinegar because it's lighter floral and fruity flavors wont get in the way of the tomatoes. We add just enough sea salt to lift the flavours without being noticeably salty. And for bottling we use minimal heat processing to avoid an overly concentrated cooked tomato flavour (almost like ketchup) but enough to ensure all pathogens are neutralized. These may well be the freshest and most tomatoey tasting canned tomatoes you've ever had. Use them in your own sauces to take them to a whole new level.